A couple from Kent have just won a million pounds and say they’ve gone from disbelief to joy. Now they’re looking forward to life after retirement! 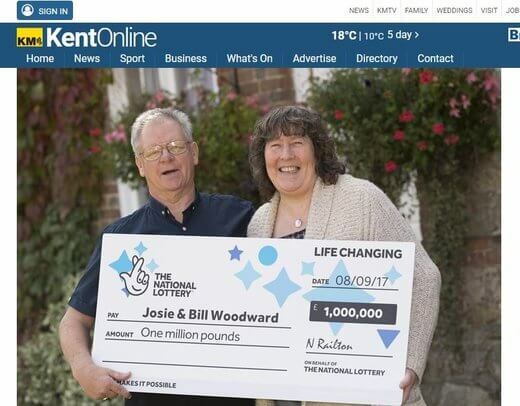 Josie and Bill Woodward purchased Euromillions lottery tickets online and didn’t give it much thought – until they received a congratulatory letter from the lottery. What they thought was just a couple pounds turned out to be a £1 million win courtesy of the EuroMillions Millionaire Maker. At first they found it hard to believe. But now they’ve started planning what to do with the money. Josie is elated that her husband, who was originally planning to work 2 years beyond retirement age to ease finances, is now putting in his notice. They also plan to leave the house they have been renting or the last 20 years and buy their own home. The couple, who have been married for 37 years, say they also want a new car and upgraded vacations. They still have not decided what to do with the rest of their fortune, but their future suddenly looks very bright.